The Rat Cage Trap - Multi Live Catch Trap will catch up to 10 rats without the need to reset. Simply bait this humane rat trap with a suitable food attractant and place where the rats are most active. 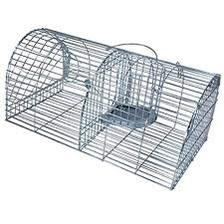 The Rat CageTrap - Multi Live Catch Trap can be of use indoors or outdoors and is made of a powder coated galvanised steel that will last for years.